If you are looking for some cute outdoor decor from Etsy to decorate your yard for Summer, you’re going to love these fun finds. July…guys, it is JULY! I just can’t wrap my head around that. This year is flying by so fast. Hopefully you’ve been enjoying your Summer so far with a lot of outdoor dining, front porch swinging, sprinkler splashing, garden tending, lawn gaming, smoring (haha..I totally just made that word up) by the the fire pit…you know all those Summery things! This month’s Etsy round up is a toast to Summer. 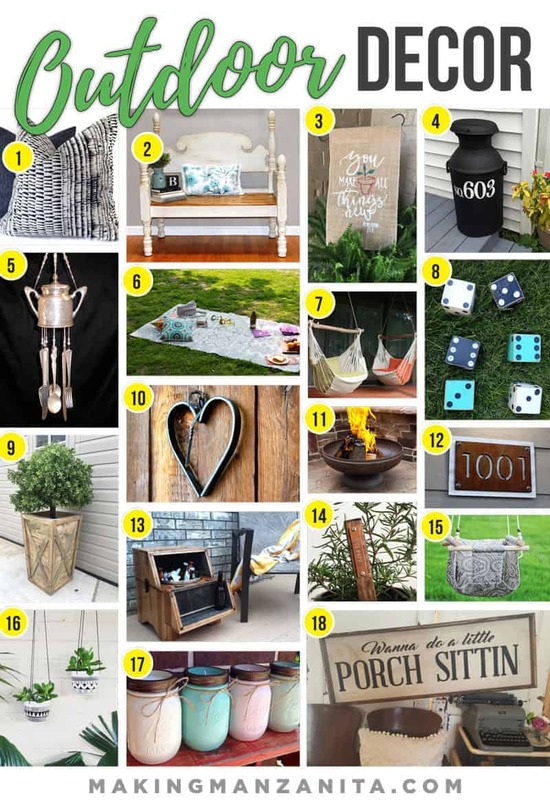 I love all of this Outdoor Decor from Etsy to decorate your yard for Summer. 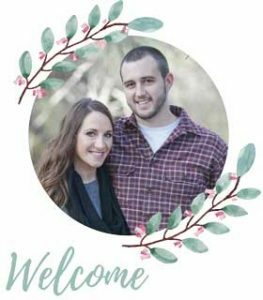 This Outdoor Decor From Etsy post contains affiliate links, but nothing that I wouldn’t wholeheartedly recommend anyway! Read my full disclosure here. Indigo Outdoor Pillow (CaliforniaLivinHome) – I absolutely love the print on this outdoor pillow! One of the secrets of adding a ton of style to a space is throw pillows. They are like the bacon of decor, the make everything better. Vintage Bench Repurposed from Bed (BitterSweetVynes) – How awesome is this?! This bed has been repurposed into a bench! I love seeing fun upcycle projects and this one is so unique. This vintage bench could be used indoors also. (Update: This one is sold out, here’s something similar). Burlap Garden Flag (TheShabbyStitchery) – This garden flag is adorable. I love the bible verse it has on it: “You make all things new.” You could stick this flag in your garden, flower beds, planter box or even your lawn. House Numbers Vinyl Decals for Milk Can (ImpressiveCreation) – I love the farmhouse feel of decorating with milk cans. One great idea of a way to use a milk can is on your front porch as outdoor decor. These vinyl house numbers will attach right onto the milk can! You could also use these vinyl decals on your front door, post, planter…you name it! She also sells a number of other vinyl decal signs in her shop! Vintage Silver Wind Chimes (TeaTimeChimes) – I couldn’t have a round up of outdoor decor finds from Etsy without wind chimes. This wind chime made from vintage silver is so cute! I’ve never seen this done and it’s such a great idea. Perfect for bringing the Shabby Chic look outdoors. Southwest Outdoor Mat (SavonJeans) – This outdoor mat is perfect for picnics on the lawn. It’s waterproof and can be wiped down for easy clean up. The best part? It folds up and rolls up so you can carry with you to the beach or the park. Hammock Chair (ChillOutChair) – I’d love to just spend the rest of the Summer in this hammock chair. I wouldn’t get much done, but man I’d be relaxed by Fall, don’t you think? I love the little pom poms on the edges of these colorful hanging chairs. Lawn Dice (CreationsByLLove) – Lawn games are one of the best parts of Summer! What’s your favorite game? These oversized lawn dice will bring your family loads of fun outside this summer. Planter Box (GoodTimberShop) – I love the look of large planter boxes on each side of the front door. It frames out the door so perfectly! I love that this large rustic planter box is dramatic! Small Heart Dinner Bell (ReedsBlacksmithShop) – Summer is definitely good for one thing…it gets the kiddos out of the house and out playing outside. When it’s time to bring the family in for dinner, just give this little dinner bell and ring and they will come running. Fire Pit (OhioFlame) – There’s something about an outdoor fire pit that just makes my heart putter a little. We have plans to install a fire pit someday (check out our backyard plans here). This fire pit is awesome because it is portable, so you could take it with you if you’re renting. Rustic Address Sign (81MetalArt) – Our house really needs an address sign, so I’ve been brainstorming and this one really caught my eye! Isn’t it awesome?! This address sign is rusted to perfect, but comes with an aluminium backing so it doesn’t stain your house. Washtub Drink Cooler (TerramaeAndCo) – This drink cooler is perfect for outdoor entertaining! It comes complete with a bottle opener on the side and the front folds down to create a shelf. When the drink cooler is closed up, it functions as a side table. How cool is that? Garden Markers (BeWayward) – We planted a big garden this year and with a garden comes the need for garden markers. I love the rustic look of these garden markers with wood and cooper. She also makes aluminum plated ones. Baby Swing (SweetSwinging) – This baby swing really caught my eye because my 1 year old LOVES swinging. On these summer nights, we’ve been doing a lot of walks to the park near our house, but it’s a bummer because it actually doesn’t have a toddler swing. It would be awesome to have a baby swing right at our house and this one is adorable. I love that you can bring it inside for the Winter if you have a place to set it up. The fabric is also customizable. Hanging Planters (LeCollecte) – These decorated black and white hanging planters are awesome because they can be moved inside if you need to for the winter. I think they would look awesome hanging around on a back porch with a bunch of fun succulents in them! Citronella Mason Jar Candles (TrailOfCreations) – The only thing I don’t like about summer nights spent outside is the dang MOSQUITOES! They are the worst. These citronella candles will help keep those pesky mosquitoes away and they are adorable at the same time. (Update: these ones are no longer sold, here’s something similar). Porch Sittin’ Farmhouse Sign (MyHeartOfAGypsy) – I love farmhouse signs…I even rounded up my favorite farmhouse signs from Etsy a couple months ago. This sweet sign will add just the perfect touch of farmhouse charm to your front porch! (Update: this is no longer sold, but here’s another cute one that’s similar). Aren’t all of these gems of Outdoor Decor from Etsy just amazing? If your backyard is needing some decor to get ready for backyard parties, this outdoor decor from Etsy should be your go to. Your outdoor space will be stylin’ and ready for all of those Summer parties.